Established in 1960, R.M. Waite Co., LLC is a recognized leader in international export management. With over 40 years of proven expertise, R.M. 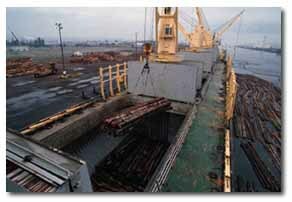 Waite provides comprehensive, customized services in all aspects of the exporting process. R.M. Waite guarantees successful results coupled with superior customer service. Based in California, R.M. Waite is a wholesale distributor and exporter of quality, U.S.-made construction and building materials, representing major North American manufacturers. R.M. Waite currently serves as export manager to major U.S. manufacturers such as Pabco Roofing and posted a 57% increase in sales in 2002. Pabco helps beautify housing projects from China to Malaysia. Read more about R.M. Waite's success in Laying a Foundation for Exports by Erin Butler. "Our greatest assets are the relationships we have established with our customers."